When I was growing up, I was a ballerina and a swimmer for a total of two days, I think. I can’t precisely recall as it was a long time ago. But I can still remember going to Ballet class and telling my daddy it was too hard and him pulling me from class. Then there were the swim lessons that I did not like, yup quit that also, and went to the beach instead! Looking at it I would like to think that those events had nothing to do with my quitting problem. Unfortunately, as a psychology student, I can see how they could be related to my quitting ways. Don’t get me wrong I am not blaming my father’s need to please me as the reason I became such a quitter. I find it odd that I recall them so well, especially when I think of my quitting. The rest of my life I had many quitting moments, like when I joined cross country ran all three-mile and then quit because my knee hurt, once. Or like the way I never kept a job for more than one to two years, exclaiming “I was not getting anywhere why should I stay.” I mean, I can go on and on, but the things are, I never saw them as quitting, but as failures with valid reasons. Until Now! After deciding that 2018 was going to be my year of growth I was faced with the reality that I am indeed a QUITTER! According to research, you form a habit after doing the action twenty-one times in a row. The reason I don’t say Good Habits only is because it can happen with ALL habits good and bad. Like eating right (good) or smoking (sorry), I’m sure we know many people with both habits, maybe even you. Mostly what I am saying is that since I started quitting when I was five-years-old, it was now ingrained in me as an adult. What I perceived difficult I would either not do at all, or start, but once it got hard, I would quit, and call it a failure. No one can blame you for trying and failing right? Yes, that’s right; no one can indeed blame you for failing, but I knew I was not failing. I was quitting, plain and simple. The problem was that I had convinced my self that me quitting were failures, something out of my control. The truth is, I was quitting to avoid failure and hurt, while slowly building a life of half as attempts a success. Then I started working toward making a blog, a business, and a name. Passionately seeking out every resource possible to achieve the success that so many others before me had obtained. With my feelings of excitement, motivation, and determination, it was a no-brainer that I was indeed going to succeed. 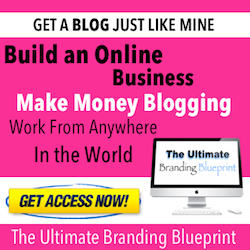 I bought all the blogging courses I could, read all the Pinterest post on how to grow your blog and business. Started writing my blog post and building my audience, learning from fellow bloggers and the likes. Yet, I was not getting anywhere; I felt like I was not growing. My blog was not getting email sign-ups, and my business was not “thriving.” I felt defeated, and I thought if I can’t reach the success now then I can’t and won’t reach it at all. Telling myself “I am not meant to do what others are doing” so I once again quit! Can you relate in any way to what I have just told you? Do you see a pattern in your life that leads to multiple attempts at greatness followed by a fast ending? If you do, then like me you may have confused quitting with failure. But don’t worry, because I have a simple mind switch that will help you STOP quitting. At the beginning of 2018, I was challenged to set an intention instead of a resolution. To pick a word to guide me in my plans for my life, blog, and business and that word was growth. I took that challenge seriously, and it’s the one thing I did not quit. I kept it in my mind every day making sure that I was growing at whatever I attempted. Except in my blog and business, and I already told you why, because I quit both. But I did keep using it to grow my self and my skills. But it was not until I watched a leadership video and heard this…” Failure is an uncontrollable circumstance; Quitting is a state of mind.” I realized, all those failures in my life had actually been Choices to Quit, and not failures. I CHOSE it; it was not an independent event that my business or my blog are not thriving. It was a deliberate choice, by my action, to slowly stop doing what was proven to work, and quit. Failure is something that happens to us, an uncontrolled event, Quitting is what you do to your self a choice to stop Achieving our Goals! My fear of failure led me to quit to prevent myself from experiencing hurt. I have feared failure All my life! When I should have been afraid of QUITTING! Here is the shift you have to make to overcome being a quitter. Start to process Failure as an action out of your control that you can be redeemed from because Failure is TEMPORARY! Accept that you chose to quit, then start to FEAR to quit. Because Quitting is a Permanent CHOICE, something that can’t be changed! Success Never Dwells in the action of Quitting! There is a big difference in quitting in life and failing in life. We are all going to fail at some point, whether it be in relationships, work, home, or life. When the time comes in your life that you experience real failure, recognize it, accept it, learn from it and move forward. Failure is Temporary, Quitting is Permanent. For the mind shift to work, you have to take an honest look at your patterns and bad habits in your life. You have to face the reality that like me, You Are A Quitter. Admit that instead of doing what is necessary, we decide to retire and retreat from our goals and objective. Now, Today, chose to stick, stand, and stay all the way to the end. Even when you fail, because failure is a temporary uncontrollable circumstance, that we can overcome, quitting is NOT. Failure is an uncontrollable circumstance, Quitting is a state of mind! As for me, well I’m working on building my success. I have a long road, but I am ready to take consistent action and real failures head-on. Because I no longer will accept a permanent state of quitting, I chose the pain of failure to taste sweet victory! Has quitting been a part of your life? What are some things you have done to overcome real failure?